Examples, solutions, videos, worksheets, and activities to help Algebra II students learn how to convert from degrees to radians and from radians to degrees. One radian is the measure of the central angle of of a circle that intercepts an arc equal in length to the radius of the circle. How to convert between degrees and radians? To convert from degrees to radians multiply by π/180° and simplify. To convert from radians to degrees multiply by 180°/π and simplify. 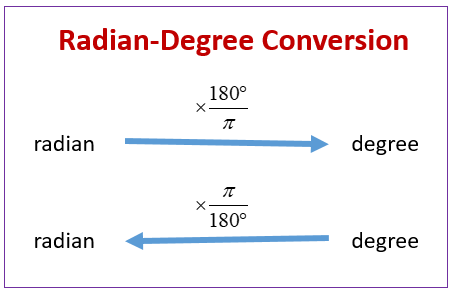 The following diagram shows how to convert from radians to degrees and from degrees to radians. Scroll down the page for more examples and solutions. Discuss how to go from radian measure to degree measure.